It turns out that there is high demand for International GDP comparisons as our previous post continues to deliver many search engine results to this day. This post provides a quick update that includes the most recently available data, though 2010 Q4. 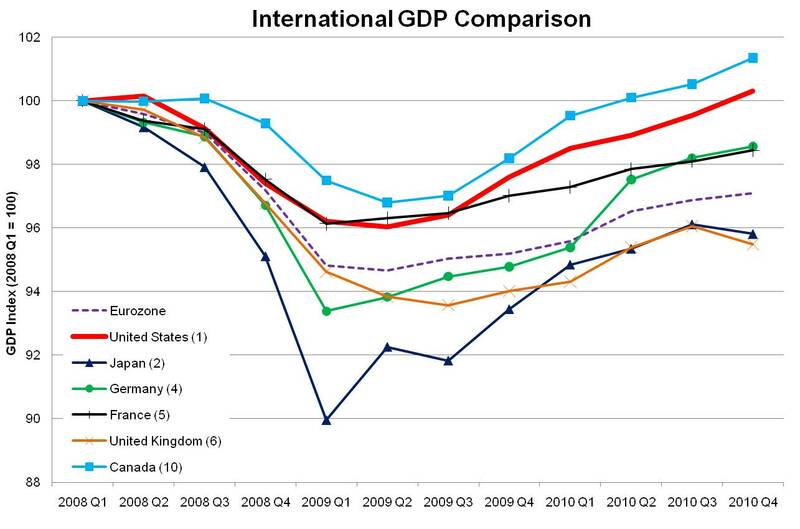 As in the previous entry, the graph and table below illustrate the relative performance of many of the largest economies in the world since the beginning of 2008. For the graph, each country’s real GDP (inflation adjusted) is normalized to its 2008 Q1 value and is tracked relative to that value over the past three years. Through the end of 2010, both Canada and the United States’ real GDP have returned to at least their pre-recession levels. Current level real GDP in Canada is 1.3 percent above pre-recession levels, while the U.S. is 0.2 percent above. That is, both countries have more than regained, however slight, the economic losses from the Great Recession. Japan and Europe continue to be below pre-recession levels, however these countries have experienced economic growth in the past year and a half. The 16 country Eurozone lost 5.3 percent of its GDP from 2008 Q1 through 2009 Q2, however their economy has grown 2.6 percent in the past six quarters, leaving it 2.9 percent below pre-recession levels. Note 1: The information above takes into account data revisions that have occurred in the past nine months. The two most prominent being a slight downward revision to US GDP during the business cycle – the peak to trough decline was revised from -3.8 percent to -4.1 percent – and the sizable downward revision to Japan’s GDP – the peak to trough decline was revised from -8.6 percent to -10.0 percent. Note 2: Japan is no longer the second largest economy as China has surpassed it, however the rankings used in the above table reflect the final, annual 2009 numbers. Once all 2010 revisions have been completed and the annual values compiled, the rankings will be updated and adjusted accordingly.